DÃ³nal McAnallen, Cultural Education & Outreach Officer, Ulster GAA, Dr CaoimhÃ­n Ã“ DÃ³naill, Diploma Course Director, Belfast, Ryan Feeney, Head of Community Development, Strategy and Public Affairs, Ulster GAA, Professor Anne Moran, PVC for Educational Partnerships & International Affairs, Dr Malachy Ã“ NÃ©ill, Head of School of Irish Language and Literature, Martin McAviney, President, Ulster GAA, Professor Alastair Adair, PVC for Development & Provost for Jordanstown & Belfast campuses, and Dr GearÃ³id Ã“ DomagÃ¡in, Diploma Course Lecturer,Cookstown. 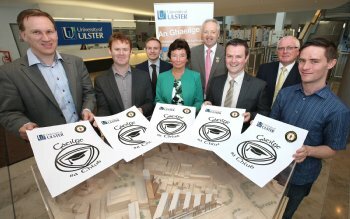 Ulster GAA has teamed up with the University of Ulster to unveila major sponsorship programme for adultstudents of the Irish language. The scholarship scheme will run in partnership with the School of Irish Language and Literature and is to be known as Gaeilge sa Chlub (‘Irish in the Club’). It aims to promote the use of Irish within clubs throughout Ulster by providing financial assistance to GAA members who sign up for the Diploma in Irish Language course at Ulster. This two-year (part-time) course is currently available at Belfast and Magee campuses with university outcentres at Cookstown, Ranafast and Downings. It runs for three months in the autumn and three months in the spring and classes are taught in each centre on Monday and Wednesday evenings (5.30pm-8.20pm). Students are instructed in listening, speaking, reading and writing and many diploma graduates progress to the degree course in Irish Language and Literature. Dr Malachy Ã“ NÃ©ill, Head of School of Irish Language and Literature at Ulster welcomed the ‘pioneering’ scheme. Further information on the Diploma in Irish Language is available from Mrs Ros O’Hagan in the School of Irish Language and Literature: r.ohagan1@ulster.ac.uk or +44 (0)28 7167 5277. To apply for the Gaeilge sa Chlub scholarship scheme you should forward your contact details to DÃ³nal McAnallen, Culture Education & Outreach Officer with Ulster GAA: donal.mcanallen.ulster@gaa.ie or +44 (0)28 3752 1900.